From the recipe archive December/09 because I've made this delicious salad a million times since and I'll be making it again this year. Happy New Year! I'm not superstitious per say. Sure I'll do a little knocking on wood every once in a while but I'm not fanatical about it. Since I got married last year and we bought our first house, I decided that I wanted to create some traditions for this new little life of mine. We had our first traditional Christmas at our house this year and started collecting some sentimental decorations. Tomorrow, New Years Day we go on a once a year binge at McDonald's (and then regret it terribly afterwards) but I needed a New Years Eve tradition and I thought this sounded fun when I came across this article on Epicurious about lucky foods to eat on New Years Eve. (Which incidentally is when I got engaged at this time last year. Whoot Whoot!) There are a lot of great ideas in the article for ringing in the new year with luck but I decided to go the lentil and pork route in the form of a spinach salad with lentils bacon and blue cheese. Four of my favorite things. The salad will be accompanied by a grilled T-Bone steak so make that five of my favorite things. I feel lucky already. Happy New Year everyone! Thank you for all of your support. I hope I've inspired some of you to try out a new recipe, perhaps when you thought you couldn't make it, much like I did not too long ago. I look forward to hearing from all of you in the new year and wish you and your loved ones a world of blessings. 1. Bring a medium sized sauce pan of water to a boil. Add the rinsed lentils, reduce heat to a simmer and cook lentils about 20 minutes or until tender. Once tender, drain the lentils, rinse with cold water and allow the lentils to cool and dry a little, about 1 hour. 2. Place the spinach in a large bowl. Add the vinaigrette and toss to coat. 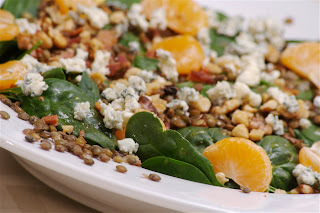 Plate the salad by placing a large bunch of spinach on a plate, sprinkle a portion of the lentils on the spinach followed by the blue cheese, bacon, walnuts, mandarin oranges. 1. Mix maple syrup, orange juice, black pepper, whisk in the olive oil. Serve over the salad and toss to coat. a) Place the walnuts in a skillet over low-medium heat and gently toast the walnuts, stirring occasionally, until they are fragrant, about 8 minutes. b) Spread the walnuts on a plate and microwave on high heat for 4-5 minutes or until fragrant. c) Preheat the oven to 350 degrees. Place the walnuts on a baking sheet and toast in the oven for 8-10 minutes or until fragrant. Whichever way you choose to toast the nuts just be sure to keep a close eye on them as they will burn very easily. I hope you've got your greens and blackeyed peas on.